Could the Jeep Wrangler Sandstorm concept give us any clues about the anticipated Jeep pickup? Not since 1992 have we had any sort of Jeep truck, and it’s definitely not for a lack of want. Enthusiasts have been using expensive conversion kits to install a bed on their Wranglers, and Jeep has created some pickups for the Easter Safari, such as the recent Wrangler Sandstorm concept. All that’s about to change, because Jeep is working on a new pickup based off the Wrangler JL. This project is shrouded in secrecy, with surprisingly few leaks to the media. Despite that, we do know a fair number of things. Keep reading to learn what the Jeep truck has in store. One of the most speculated details about this new Jeep truck is what it’ll be named. Nobody knows for sure, and Jeep isn’t saying. Some have claimed unnamed, inside sources say it will be called the Scrambler, which is a proud name from Jeep’s past. 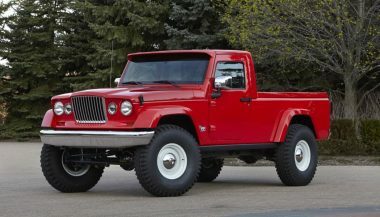 In fact, the CJ-8 Scrambler was the last pickup based on the Wrangler. We do know the chassis code for the truck will be JT. Likely there will be Sport, Sport S, Sahara and Rubicon versions of it, just like the Wrangler JL. You’ll be able to tell from a glance that this pickup is a Jeep. It has the same seven-slot front grille and the round headlights, exactly like the Wrangler JL. People all around the world associate the Jeep name with those design details, so that’s a wise move. Just like the JL, the fog lights are embedded in the front bumper, which is simple in its design. The turn signals are incorporated into the wheel flairs. Around back, the taillights also look to be identical to the JL’s rectangular units, complete with LED hourglasses. From the nose to the backdoors, the truck looks exactly like the Wrangler. Jeep has taken prototypes of this pickup truck out testing in the wild. Just like any other automaker, it uses camo, but hasn’t stripped down the vehicle to a minimal disguise. Considering all the anticipation surrounding the vehicle, don’t expect Jeep to give us a clear shot at the vehicle until it debuts. Despite all the camo, we do know a few things. The new truck will be based off the new Wrangler Unlimited. Four doors and a bed are clearly visible. Don’t expect a huge bed, because it looks a little on the small end, while still being usable, likely about 5 feet long. Unfortunately, that means a significantly worse departure angle for the truck. 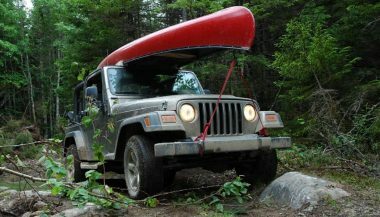 As a true Jeep, you’ll be able to remove the top and doors, plus fold down this pickup’s windshield. That alone will make it stand out in comparison to the competition. It’s possible Jeep will later reveal a two-door version with a longer bed. But, based on spy shots, that doesn’t look likely at this point. Among Wranglers, the four-door Unlimited models are far more popular, so it makes sense to release that version of the truck first, then assess if a two-door variant would be successful. Expect this truck to be offered with the same engines and four-wheel-drive systems as the Wrangler JL lineup. 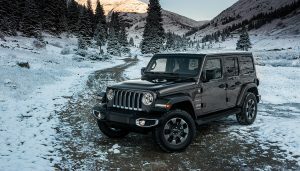 Sergio Marchionne, Fiat Chrysler’s CEO, has told the media he expects to move about 100,000 of these Wrangler-based pickups each year, which is enough to justify using everything offered for the Wrangler. That means you’ll be able to choose among the trusty 3.6-liter Pentastar V6, the all-new turbo 2.0-liter four-cylinder with 285 horsepower, or the 3.0-liter EcoDiesel with 442 lb-ft of torque on tap. With the EcoDiesel, towing capacity probably tops out at 6,500 pounds. Three four-wheel-drive systems are available for the JL. That means the basic Selec-Trac that can be set to switch on automatically will be the base offering. If you want something better-suited for hitting trails, Command-Trac with a 2.72:1 low range is a better option. Finally, there’s Rock-Trac with a 4:1 low gear ratio and electronic locking front/rear differentials, which is standard on the Rubicon. Not surprisingly, the latest spy photos reveal a rear suspension that looks almost exactly like what the Ram 1500 uses. That should mean the bed will be able to handle a fair amount of weight, but it will have an effect on the rock-crawling capabilities of the truck. A Dana 12-bolt rear axle is also included on the truck, a necessary addition for the workhorse. Of course, the front axle is solid, just like on the Wrangler. 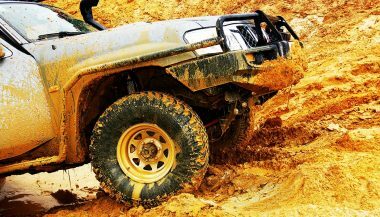 A ladder frame helps maintain good rigidity for off-roading. In other words, this truck won’t handle like a car, so it’ll be nothing like the Honda Ridgeline. If you’ve sat in the Wrangler JL, you’ll find the JT pickup to be quite familiar. All indications are that the truck will be identical for the front and rear seating areas, which isn’t all bad. That means you get an interior able to withstand all kinds of harsh weather, but one that’s still reasonably comfortable. Don’t forget that the JL can be outfitted with some nice luxuries, like leather upholstery and seat heaters. There’s plenty of speculation about when the Jeep Wrangler pickup truck will finally be revealed. Common consensus is that we’ll see it at this year’s Los Angeles Auto Show, which begins on November 30. Jeep could opt to reveal the truck a few days before. While Jeep could wait until the next Detroit auto show, that’s not very likely. After all, the Wrangler JL debuted in Los Angeles last year. As far as hitting showrooms, the Jeep truck should be coming to a dealership near you in April of 2019. This isn’t a guess, but instead comes from an Automotive News interview with various Fiat-Chrysler dealers after a meeting with the automaker in March of this year. 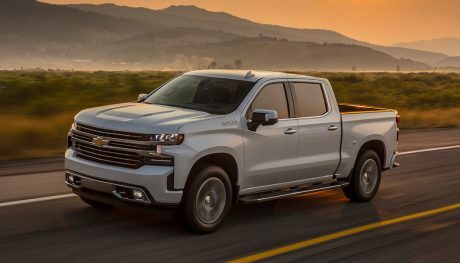 Production of the truck begins in the fourth quarter of 2018, so a good supply of them should be available at launch. Still, demand is predicted to be sky-high, so you’ll need to be quick once Fiat Chrysler starts taking pre-orders. The most iconic American utility vehicle is now the most American made car according to an annual survey conducted by Cars.com.